I knew I wouldn’t make a ton of progress this week because I’d be out of town over the weekend, so I’m ok with what I accomplished. I also had an epiphany about working on this piece that it will be done when it gets done and rather than whine about how boring the long solid colors are, I’m just going to work on them when I feel like it for as long as I feel like it and then put the piece down. It was nice getting a rest over the weekend and I didn’t pick it up again until yesterday. I stitched a bit of blue and a bit of white while watching Captain America 2 and it was nice—which is how it’s supposed to be. So, if this project stretches on a bit, so be it. 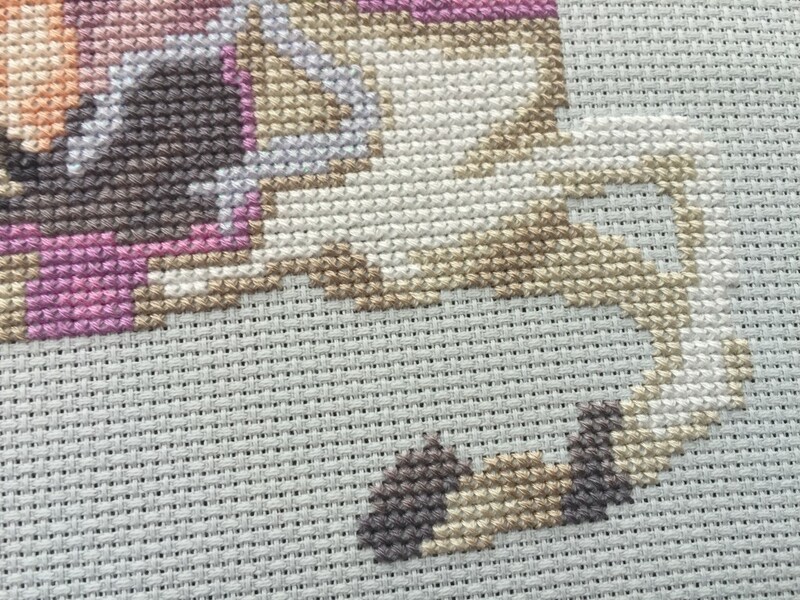 I have other goals (trying to study Japanese more diligently) and cross stitch can eat into a good amount of leisure time if you let it. So, without further ado I present my progress for the week. And how much I’ll get done next week? Who knows. It’s supposed to be a pleasure, so I’ll let it be. I’m still quite excited to see it done, so I know I will finish it. 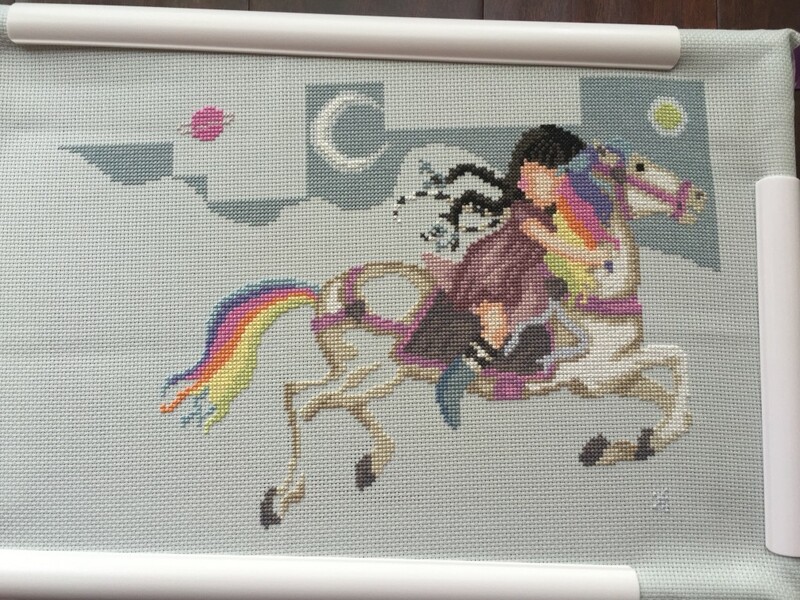 I still have about 55 stitches to the left of where this ends, so I’ll have to move the piece in the frame to finish. My little pink planet. 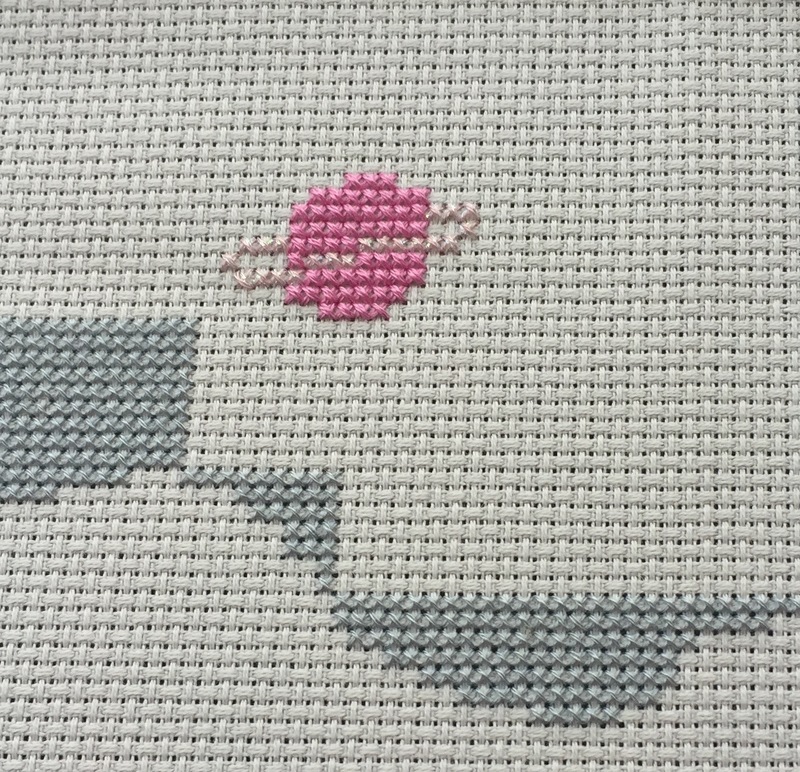 If you look *really* close you can tell the ring is worked with 1 pinkish color and 1 sparkle strand.